YouTube is starting to roll out higher resolution versions of videos on the site. What this means for viewers is text that looks crisp; improved sound quality; and video that loses some of those soft moments and blocky transitions we've come to expect from watching YouTube videos. 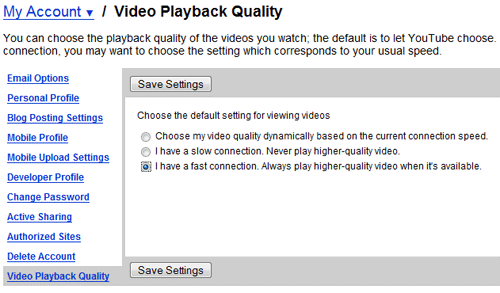 There are two ways to get better video from YouTube, depending on whether you do or do not have a YouTube account. If you happen to have a YouTube account, you can tweak your account settings to improve the way YouTube videos look. Go to your account settings and look for the Video Playback Quality link all the way at the bottom. This gives you three choices, which are basically let YouTube decide what to show you (which means you get ugly video), the slow connection setting (which means you get ugly video), or the fast connection option (which provides a slightly improved video experience). If you don't have a YouTube account, the only way to get this to work is to use the secret handshake. When you get to a page with a video you want to watch, you need to tack some additional code on the end of the URL before you'll get the upgraded experience. Hopefully this is a short term fix, but in the meantime it's like turning a Man into a Mane with silent 'e'. Six little characters and it's like stepping out of a fog. Supposedly there's an even higher quality setting achieved by adding &fmt=18 to the end of the URL instead of &fmt=6, but so far I haven't seen a video where this makes a difference. You can also build your own high quality embeds using my YouTube code generator.